Salary of a nursing assistant motivates him/her to offer the best services and to face challenges of this occupation. As per the figures of the BLS (May 2013), around 24,350 nurse aides were employed in the state of Kentucky, and the employment per 1000 jobs was 13.66. The mean annual wage was projected to be approximately $23,290 while the mean hourly pay was analyzed to be about $11.20. 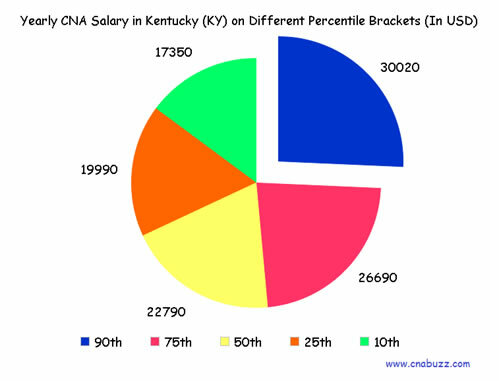 As per the information submitted by indeed.com, the average CNA salary in KY, in January 2015, was $21,000. The average CNA income for job postings was 14% lower in Kentucky than other states in the country. Working location and experience of a nurse majorly affects the wage of a CNA. 90% of CNAs made less than $30,020; 10% made more than $30,020. 75% of certified nurse assistants received less than $26,690; the remaining 25% were paid more than $26,690. 50% of the nurse aides earned less than $22,790; rest 50% received more than $22,790. 25% of employees were offered annual wages less than $19,990; 75% were paid more than $19,990. 10% of CNAs were salaried less than $17,350; 90% were offered more than $17,350. Geographic location is an important factor that affects the salary of a nursing assistant. As of January 2015, the top paying city of KY was Covington with median annual salary of $26,073. On the contrary, Owensboro offered the lowest annual income of $23,341. The median hourly wages vary from $11 to $13. Apart from the geographic location, position is another major factor on which the salary of a CNA depends. There are numerous job titles in the nursing profession, and one can realize any of them. In January 2015, according to indeed.com, CNA Hospice was paid the highest salary, i.e. $27,000. Medical Assistant Family Practice and CNA Rrmc were paid $25,000. Nursing assistants were given between $13,000 and $23,000. A rise of 21 percent job opportunities is predicted to be offered to the qualified nursing assistants in the upcoming years. The demand of CNAs will decline only from the fact that many nursing homes still depend on the funds provided by the government. However, the mounting rates of a number of chronic conditions will certainly augment the demand. Question 1 – Can anyone suggest some of the best paying job titles in Kentucky? Answer – In Kentucky, CNA Hospice receive the highest income of $27,000. Other top paying job titles are CNA Float Pool Riverbend, CNA Rrmc, CNA Medical Surgical, CNA Neurology Riverbend, and Medical Assistant Family Practice. Question 2 – Currently, I am employed as a CNA in Washington, but planning to shift to Kentucky. How much income I can anticipate? Answer – CNAs wishing to start their nursing career in the state of KY can expect an average annual pay of $21,000.